As jobseekers we all know the importance of Linkedin, but how are companies using the network to recruit employees? The curtains were lifted today in Barcelona, at a round table among HR managers, headhunters & networking professionals active on the Spanish labour market. 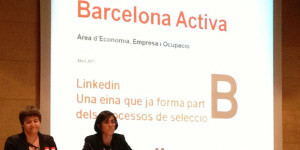 The fully booked event entitled “LinkedIn, an inherent tool of today’s recruitment process” was organized by Barcelona Activa, the jobplacement service of the city of Barcelona. Among the speakers: Ana León (@ALeonPellicer), HR expert of Random House Mandadori, Cristina del Castillo, HR manager & shareholder of Fluidra, Verònica Platas (@vplatas), HR manager of Maurilia and Oscar Cabo from Adecco Professional. Moderation was taken care of by Rosaura Alastruey (@rosauralastruey), consultant at Proyectos TIC. 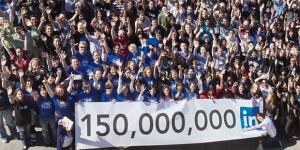 With 3 million Spanish users, Spain is one of the countries were LinkedIn became very succesful. When the company first opened an office in Madrid, a video was launched that explains its success story. NEVER send an invite with the default message: explain why you want to connect! skills are not valid if they aren’t endorsed by anyone! How do recruiters find you on LinkedIn? Most employers use the premium version, which enables them to post job announcements but also use powerful filters to shortlist possible candidates based on a certain location, a certain company they’ve worked for, etc. Important: you need at least 50 first grade contacts before these filters present your profile to any employer! What do recruiters pay attention to on LinkedIn? Cristina del Castillo continues: “In this second phase, we try to find out if the person really has the claimed experience, if he or she is active, pro-active, resilient, empathic, emotional intelligent, has social skills, knows how to listen, has the competence to adapt to changes, is engaged and honest. All this we can find out by checking a person’s behaviour on his or her different social media profiles. If we see their is no coherence in his or her behaviour, skills or interests the person most certainly will not be shortlisted. To close the session, Rosaura Alastruey came up with a video presenting the dating service Hitch.me, related to the professional profiles on LinkedIn. “In case your efforts on LinkedIn do not lead to finding a job, they won’t be lost if you can book results in your private life!”, Rosaura concluded.